music surely is the beating heart of the who we are. once you’re here you’ll feel it too. stop by bono and the edge as you make your way to check in. let us entertain you in the uber stylish hemi bar. you’ll even find you can’t help falling in love with our famous first dates restaurant; coda eatery. our guests are who we are. since the beginning its been all about you. you are or co-writers, our backing singers and the headline act. we listen, learn and love to make your stay unforgettable. music is our heart and guest satisfaction is our soul. get the band back on the road and come on tour with us. dublin’s fair city is the venue and the gibson hotel is your stage. so sleep, eat, meet with us. take our hands, we’ll make it i swear. the gibson hotel is a proud member of the dalata hotel group, ireland’s largest hotel operator with a current portfolio of 38 hotels. the gibson hotel is located right beside the 3arena, making it the closest hotel to the venue. We have stunning views of dublin port and the city from our 3rd floor bar and restaurant and our stratocaster meeting space. the gibson is located in the heart of dublin city and dublin port in the IFSC – the International Financial Services Centre. staying at the gibson ensures you are within walking distance of all of the companies based in the IFSC, which is home to some of the world’s largest organisations. the IFSC is a hive of activity, with more than 400 international operations trading here. it is home to half of the world’s top 50 banks and insurance companies, including citigroup, zurich bank, HSBC, JP Morgan, societe generale, BNY mellon, athora, ANL goodbody, KPMG, aon group, PWC, SMBC and hubspot. 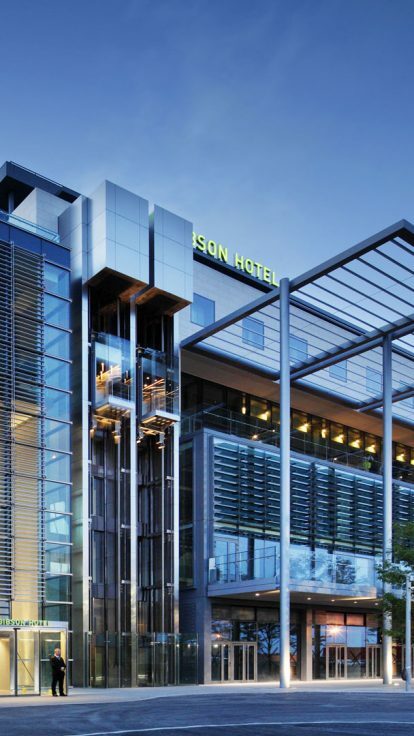 Whether you are visiting the IFSC, 3arena, the convention centre dublin (CCD) or bord gais energy theatre, the gibson hotel is right in the centre of it all.